These blue and white bedroom ideas showcasing a variety of design styles, finishes and materials. Bedrooms are the best place you go to relax and unwind. When designed appropriately, bedrooms can be a sanctuary wherein you can alleviate the stress of your everyday life. Each bedroom is perfectly planned to have such serene décor through the selection of colors, layout of furniture, choosing different fabric materials and cozy bedding. A bedroom can surely make you feel both at peace and in high spirits. Below we’ll cover some of the best ways to create a blue and white bedroom design you’ll love. A wonderful, absolute place for a tranquil retreat after a long day, the beautiful master’s suite in the picture above incorporates powder blue walls, a classic white recessed ceiling and a beige carpet flooring. A black wrought Queen size bed with shaggy and printed decorative pillows acts as the focal point of this charming haven. The black and white printed bed runner provides a soft accent which breaks off the clean crisp color of white duvets. Dainty printed cafe curtains adorn the glass french windows with white trims. Set up next to it is a classic tufted white chair which serves as the perfect relaxation spot for reading a book. In the other corner stands a dark stained armoire with glass knobs that perfectly match the elegant glass chandelier at the center of the room. The color scheme is balanced with more classic accessories like the beige table lamp and the black and white flower paintings. 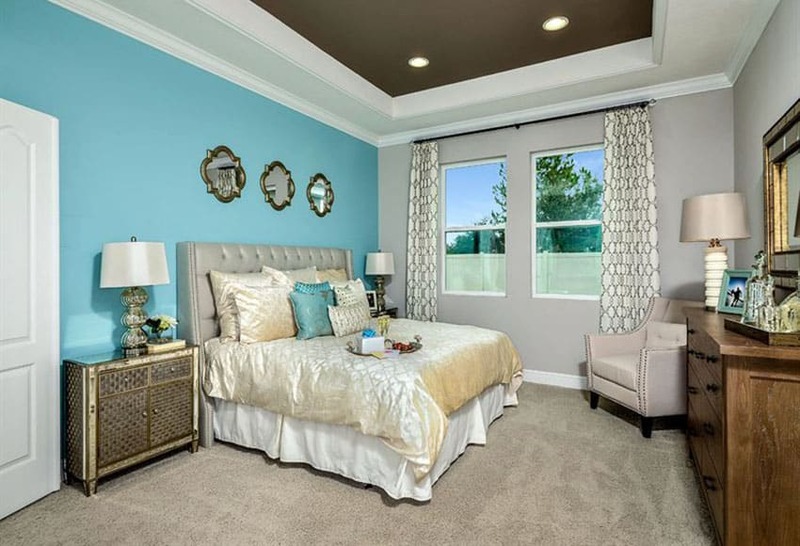 One integral part of bedroom design is choosing the perfect color palette for your interior. Scientific studies prove that colors affect our emotions, behavior and perception of spaces. Consequently, the colors that we choose for our interiors do not only affect the visual aesthetic of our home but our moods too. While others may perceive it to be it to be as easy as assigning your favorite color to fill up your bedroom, this aspect must be carefully planned and given attention to. After all, it wouldn’t hurt if we know a bit of color basics to help us decide which ones among the endless choices suit our needs best. 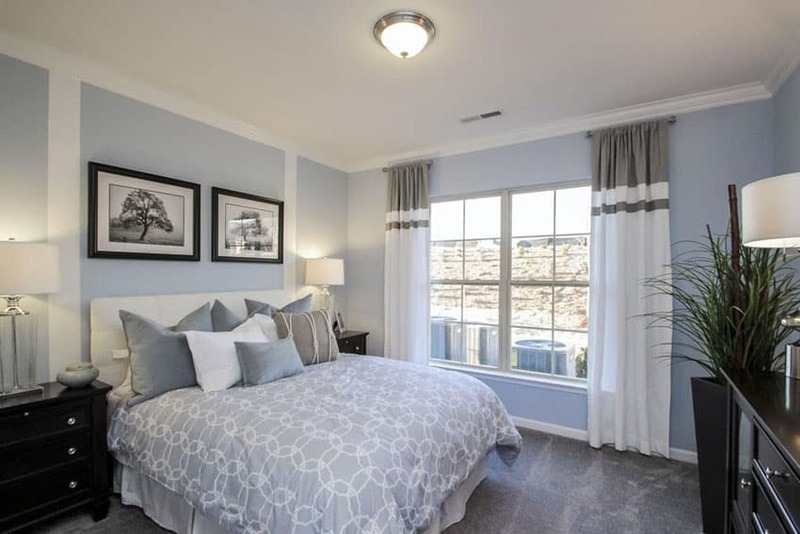 Read on as we help you explore the beauty of the colors white and blue and what makes them the top choices for bedroom colors. 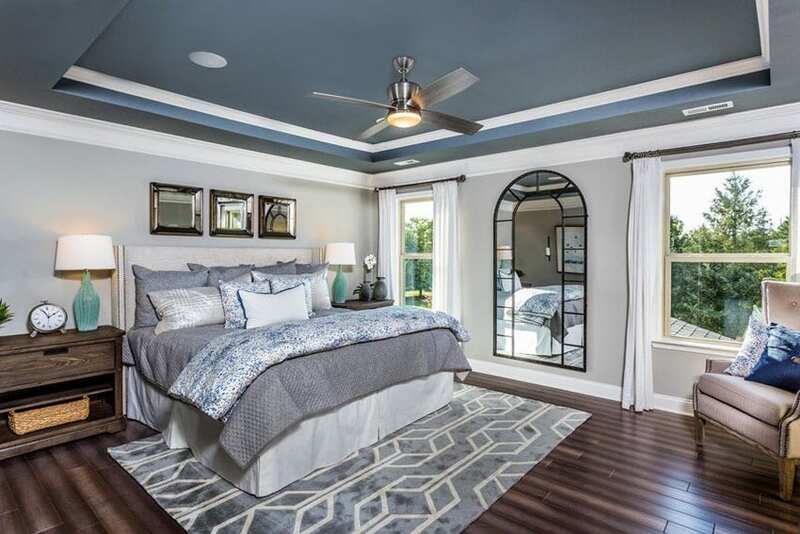 This large trendy master bedroom comes with a blue green accent wall that creates a simple yet striking statement. Combined with neutral white walls which provide the perfect canvass for other design components to stand out, this bedroom truly creates a serene scene. The mellow combination of colors produce an ambiance that is similar to the calming effect of clear blue skies. Subtle furnishings, such as the classic arm chairs by the sitting area, display soft neutral shades which complement this bedroom’s delicate color scheme. Floor to ceiling light blue curtains harmoniously blend with the walls, conforming to the collected appeal of the space. Formal beige toned accessories and a powder blue and white printed carpet add contrast to dark hardwood flooring, while the ebony stained chest of drawers brings warmth and a cozy feel to this elegant retreat. Like the color of the sea and sky, blue is associated with serenity and calmness. This cool hue emanates a relaxing feel and makes interiors look refreshing. Different shades of blue are recognized to improve concentration and associated with intelligence. It is also the perfect choice for a study room or work and office area as it stimulates thinking and at the same time promotes intelligence. It is also the color linked to creativity and imagination. People who spends most of their working hours in blue colored rooms, are more productive. Blue is also related with confidence and inspires trust. On the other hand, different shades and variation of blue suggests aloofness, coldness and showing little or lack of emotion. Some studies even shows that the color blue can suppress appetite; since there are not much blue colored natural foods and often times signs of spoilage is often seen as blue colored. Since the color blue radiates peace and calm, the key to creating a soothing atmosphere for your bedroom is to include shades of blue in your color palette. Blue is the most popular color for decorating bedrooms because this color promotes meditation and tranquility. Enhancing mental health and alleviating stress, this color is appropriate for rooms which encourages sleep, rest and relaxation. It is also the best choice for bedrooms because of its adaptability to perfectly match other colors with just about any design theme. White color often times offers the concept of purity, simplicity and sophistication. White is the color of perfection, wholeness and completion. It is oftentimes associated with new beginnings. The color white heightens the perception of space in a room and contains in itself an equal balance of all the colors of the spectrum. Unlike the color blue that stimulates the senses, the color white awakens openness, growth and creativity leading to a way for new creations to be conceived like working with a blank canvass. White also offers a sense of calmness, comfort, hope, and creates a sense of order. It is best when used in simple designs in order to emphasize certain things and thus, create an elegant look. But, do not use white in excess because too much would give a feeling of emptiness, coldness, sterility and lack of interest. If this is the case, the secret is to design a layer of white tints such as from chalk white up to ivory white. You may also use white color with textures such as textured walls, textiles and floor coverings in order to soften the look of the room and will make the white room more inviting and warmer. 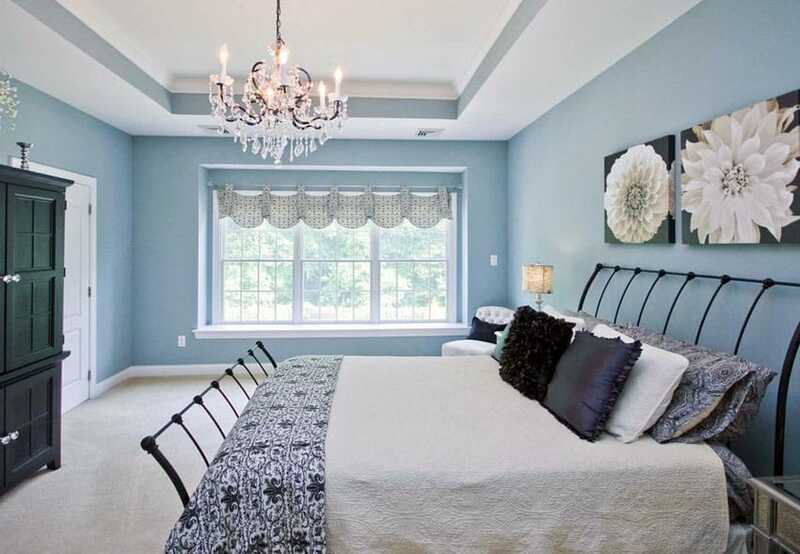 Sophisticated and graceful, this elegant master’s bedroom uses a cool palette comprised of soft neutral shades of white, black, gray and bluish gray. The combination of these colors achieve a serene ambiance which give off a tranquil mood that is perfect for relaxation. The addition of different textures such as soft fabrics and hard surfaces, create depth and dimension, preventing the monochromatic scheme of this space from becoming too plain and boring. Variation and contrast in finishes are also achieved through the use of different patterns and textures of fabrics, such as the printed duvet cover, plush velvet decorative pillows, white upholstered headboard and sheer light curtains. Dark gray carpet flooring, glass lamp shades and chrome silver accessories all tie up the luxurious look of this space. The classic pairing of blue and white has always been a popular choice around the world. Blue and white are a timeless favorite for classic American, cottage inspired or country style palette. However, it’s applications are not limited to traditional designs and concepts. This versatile color combination can be used to amp up classical scenes to give them a more updated vibe and can be used for modern interiors to give them a casual or a formal appeal. Throughout the history of decorating, this classic pairing has proven itself to be endlessly flexible and ageless. It can be used to make rooms look effortlessly chic as it blends well with most types of furnishings and works well in any design setting. It is also considered to be one of the easiest ways to keep your home looking fresh and at its best. Designing a bedroom with blue and white interiors provide for endless possibilities in terms of decor. Whether it may be an all white room with bold blue accents or a reversed palette of dark blue canvas with white furniture and furnishings, this duo provides for more experimentation in accessorizing. This color combo works particularly well when layered with a lot of textures, as in wood, printed fabric, rattan or wicker. The addition of textures give it variation and make it more visually interesting too. The combination of the color blue and white is also the perfect opportunity introduce patterns into your home’s interior. Stripes, in particular, make strong foundations for design without being too overwhelming or “patterny”. Small details also make a big impact – meaning these patterns can be downplayed to a minimum in order to create just the right amount of punch to a blue and white room. In addition to that, adding bit of color won’t hurt your design sensibilities too. Brown tones found in light to medium stained woods bring a natural coziness and richness to this color palette, creating a perfect balance of cool and warm. Black also works well with this color combination especially if you want to punctuate, highlight or give a bit of an edge. Other complementing colors that are ideal for this color pairing are taupe, gray or green, while bold contrasts that work well are warm, rich hues like red, orange or yellow. With regards to the psychology of color, the perfect combination of blue and white makes it highly appropriate for bedrooms because it creates a balance of peace and purity. It is the ultimate combination for a room, where calmness and serenity are associated with simplicity and sophistication. A tranquil haven where you can feel refreshed and well rested. Of course, you wouldn’t want a bedroom that’s too intense and distracting when you lie down in your bed at night. 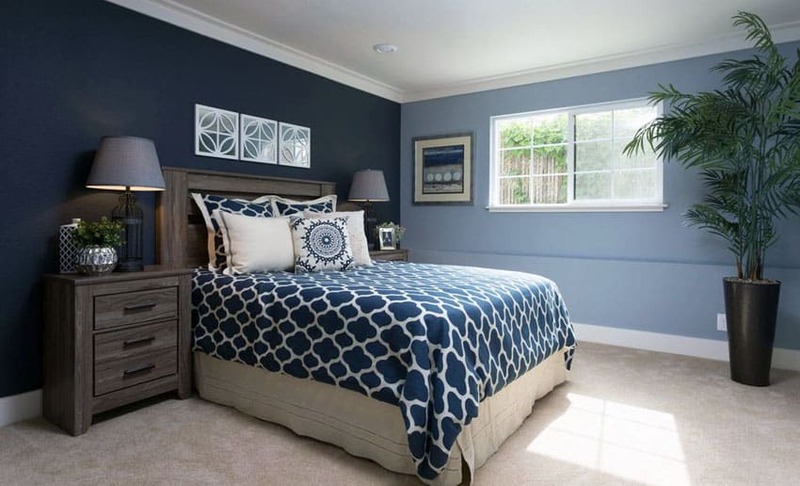 The following bedroom design collections will offer you ideas using combination of blue and white and show you how best to use these two colors in order to bring out a unique style that’s cool, serene and sophisticated. This chic beach inspired master’s bedroom features French blue walls and complementing furniture, furnishings and accessories. Overall, it produces a calming atmosphere which is perfect for some rest and relaxation after a long and tiring day from work..The same refreshing shades of blue are carried out through matching pillows and bed skirts . To complete the look of a beach inspired retreat, light wood flooring mirrors the color of the sand, while the white ceilings reflect the bright color of the skies. 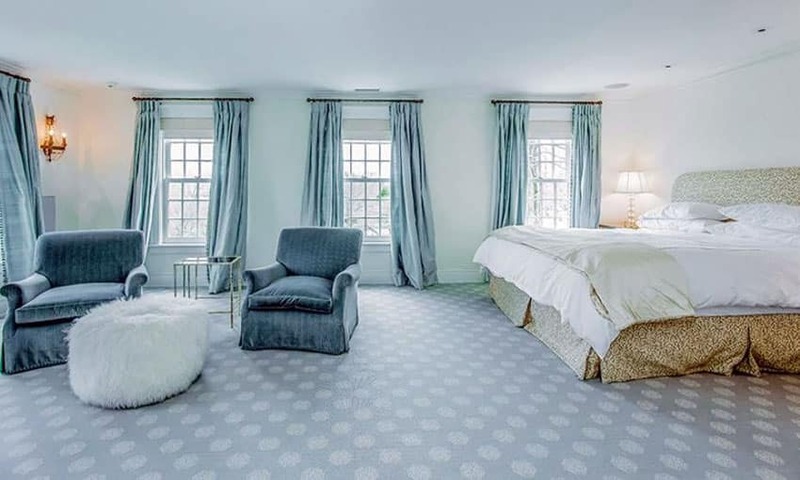 The design also displays a repeating flower and leaf motif that is applied through the use of a brown floral area rug, a white duvet cover with dainty floral patterns and a matching hanging artwork. White trims, doors and baseboards creates balance to the color scheme, while formal elements such as the crystal chandelier and silver night lamps with white shades add a classic flair to the room. This contemporary classic white and blue bedroom combine traditional elegance and rustic country charm. Traditional elegance is displayed through the use of classic furniture pieces ,while the prominence of wood in the furnishings and conforms with a rustic country inspiration. Cool gray walls that are lined with white trims and baseboards make this space appear more expansive. A subtle formal contrast is added through the use of a gray and blue recessed ceiling that also creates an illusion of height for this bedroom. Dark walnut stained wood flooring and matching walnut wood bedside tables bring natural coziness and warmth to the overall mood of this space. To update the look of this bedroom, a graphic printed area rug is placed at the center to brings dynamics and movement to the design. 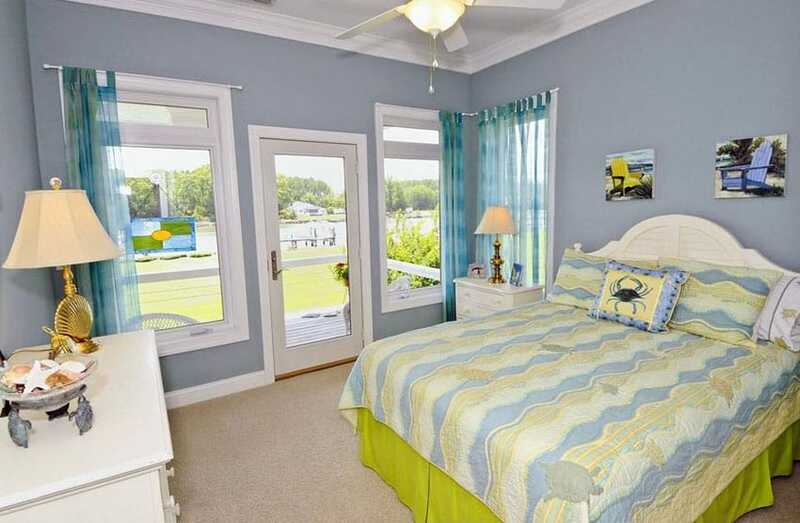 This delightful coastal bedroom has a matching color palette with the hues of the surrounding view of the ocean. The wainscot walls combine a pigeon blue hue with white panels, giving an illusion of a heightened ceiling. Traditional furniture pieces with elegant silhouettes, such as this magnificent four poster bed with spires or pointed finials and the roman inspired upholstered crossed legs stool, look more updated when combined with a muted blue and white palette. Contrary to heavily printed fabrics or rich exuberant upholstery, these classic pieces get an instant transformation from being too traditional into something more current but still timeless. Beige and taupe printed drapes match the medium stained wooden flooring and the antique finish of the bed posts while the walnut stained side table provide a natural contrast in terms of color and mood. From this we can also see how the refreshing combination of blue and white can relax a space visually. Turn your attic into a cozy cottage inspired retreat by combining the cool calming effect of blue walls with the classic charm of white ceiling and furnishings. This attic bedroom boasts of a vaulted ceiling, crown moldings over french glass windows and white paneled built in cabinets doors that conform with traditional country style architectural details. A light stained wooden chest of drawers bring contrast and contributes a warm accent to the delicate color palette of this bedroom’s interior, while the layering of crisp white bed linens make the space appear more bright and airy. Black is the perfect addition to a classic blue and white color combination because it gives a bit of an edge, without creating an overwhelming look. Gray, on the other hand, displays a quiet strength, making for a great accent color without being too vivid or bright. Combined together, these four colors create a perfect color scheme that is ideal for modern interiors and formal bedrooms. This modern elegant bedroom conforms with neutrality yet displays intensity. Crisp white linens with gray accents match the soft gray tones of the concrete flooring and the towering round column. The white walls and white ceilings create a smooth transition which also makes this space appear bigger. Black furniture pieces like the leather upholstered bed and high gloss night tables serve as statement pieces that brings strong contrast to the space. 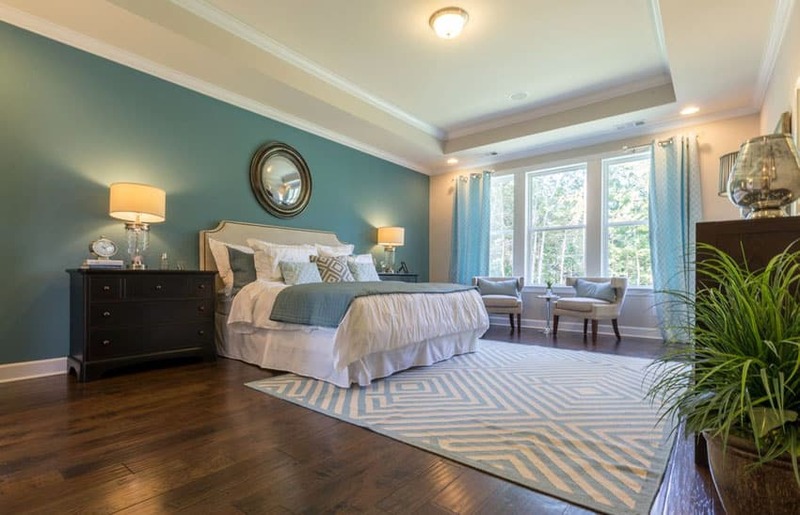 Hardwood flooring is one of the easiest ways to create contrast in a “blue and white” bedroom. Most homeowners go for this approach because not only does it break the colors, but it also contributes a distinctive natural appeal to the space. 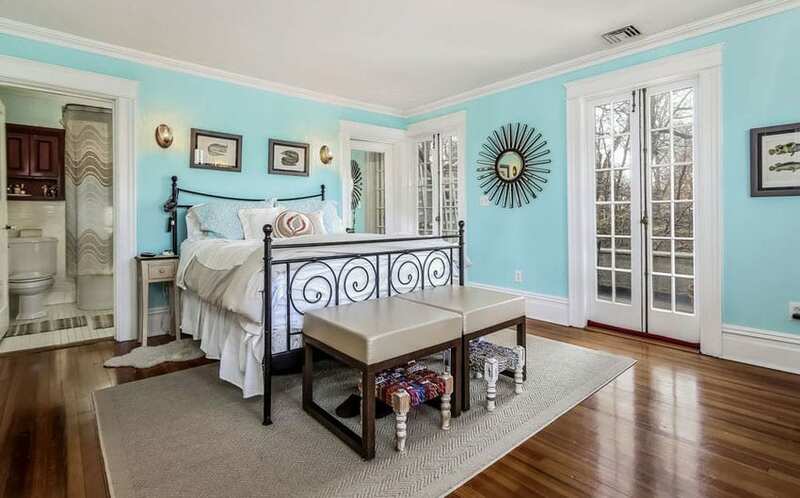 This chic cottage style bedroom combines the fresh cool hues of light maya blue, the brightness of white ceilings and the warmth of stained hardwood floors. Beige and taupe furniture and furnishings, such as the ottomans at the end of the bed and the herringbone knitted area rug all add a touch of classic sophistication and charm. While the use of a wrought iron bed creates a subtle statement that goes with the hanging metal and mirror accessory on the wall. An effective way to add visual interest to a “blue and white” interior is to incorporate prints and patterns into your design. As shown in the picture above, we can see how the printed area rug transforms this whole room into a welcoming abode, directing eyes towards the flooring and giving warmth to a cool mellow color scheme of the space. Layering fabrics, such as the white and blue printed bedding, add an instant refresh that contributes charm – whether the patterns may be streamlined geometrical shapes, preppy stripes or highly ornate florals and brocades. The dark furniture pieces, as in the leather upholstered bed and the dark brown chest of drawers, also provide contrast to the calming sense of steel blue walls and the light airy feel of white ceilings. A deep rich shade of blue makes a strong foundation for a stunning bedroom design because it makes all of the other elements stand out. The navy blue paint on the accent wall of this bedroom creates a bold statement while making the white ceiling look more crisp. 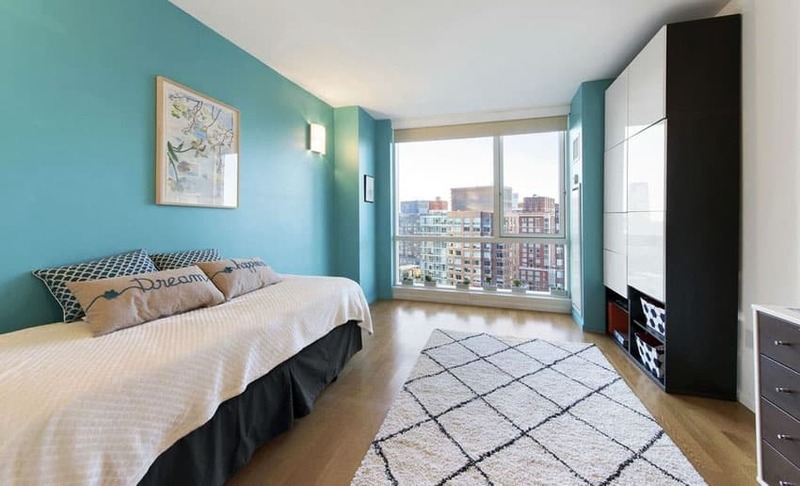 In contrast to the beige pile carpet flooring, the blue walls also add breeziness and calm to the space. The wall on the right, however, is toned down to create dimension and to break off the heaviness. The graphic print on the beddings also create a visual impact that isn’t too overwhelming, while serving as harmonious complements to the identical shade of the wall. Wooden furniture pieces add just the right amount of diversity without deviating from the semi formal look of the interior. Transform the classic “blue and white pairing” into rich color palette by adding touches of deep purple and shades of violet. Combing the peacefulness of the color blue and the uplifting spirits and regal beauty of the color purple, this bedroom interior is perfect for homeowners who are free spirited and artistic. This glam bedroom boasts of a fully upholstered queen size bed in lavish sky blue velvet fabric. Matching shiny drapes are used to liven up the appearance of plain powder blue walls while plush purple accent chairs contribute glamour and a chic style. The addition of light stained wooden furniture pieces complement the light plank flooring which gives depth to the space. If you love the natural coziness of wood and the old world feel of traditional furniture, using a blue and white color palette can help you soften the rich graining patterns of wood and the ornate design details of carved furniture. Blue creates a contrasting cool feeling to the warmth of dark stained wood. A bluish gray tone for the walls give a subtle hint of color that does not deviate much from a neutral color palette, while white doors and trims and white ceiling cornices provide a complementing color which balances the look of the space. A darker shade of blue which is used for the bed covers, together with the large printed white and blue are rug make an interesting statement. They say that “the color blue relaxes a space visually and spatially”. The sky blue walls on this charming traditional inspired bedroom lend a refreshing air and homey ambiance to the interiors of the space. With dainty printed fabrics for the bedding combined with crisp white linens and sky blue pillows, this bedroom flourishes with charm and displays more of a feminine touch. The single red accent pillow also provides a sudden pop of color that doesn’t clash with the muted palette of the interior, while color coordinating accessories bring the over all look into a single cohesive design. As displayed in most cottage inspired bedrooms, this also has a single wooden furniture piece that sets the warmth and natural coziness to the space. Add a major relaxed appeal to bedrooms by combining casual furniture pieces with a contemporary color palette. 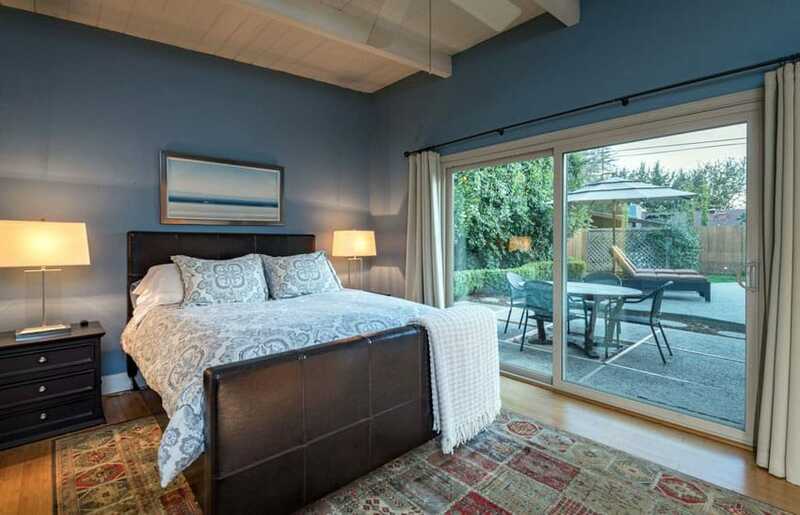 This modern guest’s bedroom has light blue electric walls that emanate a calming spirit. Combined with white high gloss finishes for the built in closets, this pairing exhibits a modern vibe while producing an ultra sleek look for the space. The twin size bed with charcoal gray skirting, white linens and graphic printed pillows are perfect complements to the white and gray printed accent rug at the center of the room. This bedroom also takes advantage of the natural lighting coming from the full glazed windows by not using window treatments. This contemporary blue and white bedroom combines accents of silver and black to create depth and added dimension in the design. Bluish gray walls, just like shown in this picture, provide a modern alternative to traditional neutral colors like white. Combing gray with a tinge of blue hue gives it more appeal and tones it down to a less formal shade that is perfect for experimenting with styles. 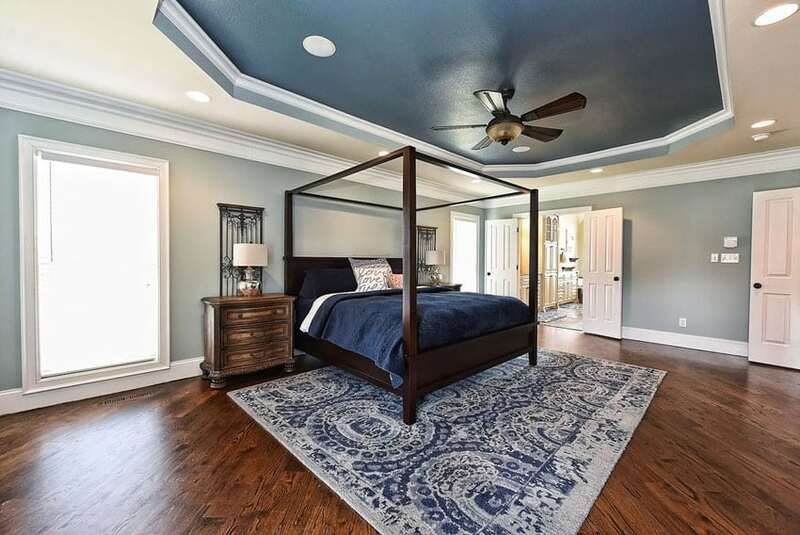 This bedroom boasts of cool walls and ceilings combined with dark hardwood flooring. The warm gray throw and velvet black pillows stand in stark contrast against white beddings, while the addition of ultra stylish furniture pieces like the mirrored tables and frames all make this bedroom appear classy and luxurious. Bring life to a classic neutral interior by introducing an unexpected accent color such as the light blue paint for the bed wall. Classic interiors are known for their neutral color palettes with formal highlights, however if you want to tweak things up a bit and make it more of your own, then the perfect shade of blue can help you do the trick. Blue goes well with classic interiors because they aren’t too intense unlike the color red, also they are perfect for bedroom interiors because they help create a restful mood. 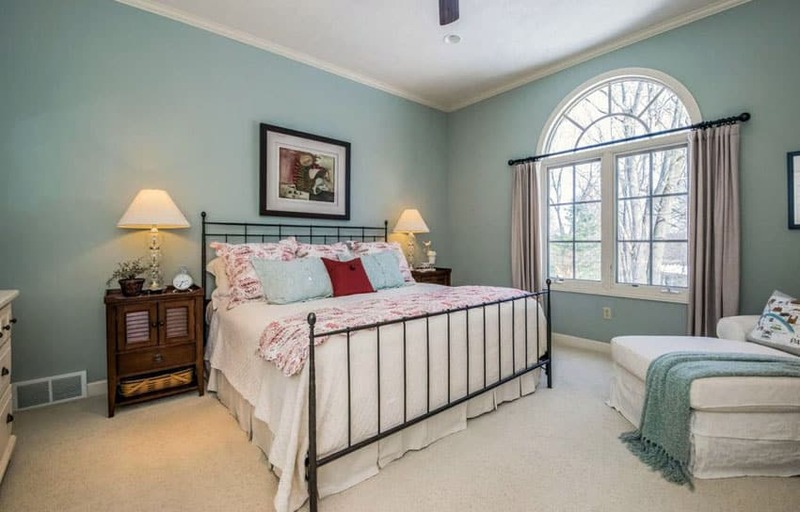 This master’s bedroom combines beige walls, white ceilings with an invigorating shade of blue. Layered fabrics if varying soft textures make this bedroom more luxurious, while classic gilded night tables contribute sophisticated bold accents to the overall look of the interior. Blue and white color schemes are the top choices for beach themed bedrooms because they remind us of refreshing turquoise waters, clear bright skies and the warm sand on our feet. However, you can go for a bit of a punch by introducing shades of green into your color palette for that added tropical charm. 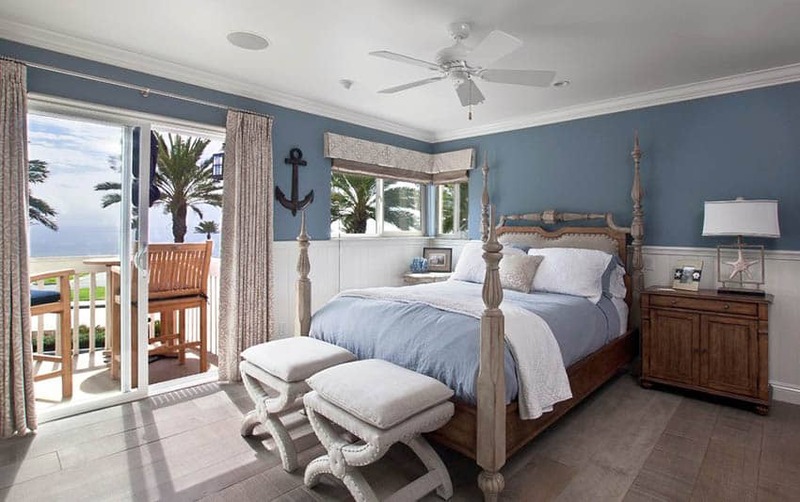 This coastal bedroom reflects all the colors of the ocean, turning this haven into a summer retreat – from the light blue colored walls, to the pristine white ceiling and the sandy beige carpet flooring. Green bed skirts give us colors that are reminiscent of the sea foam and sea weeds. Even the accessories strictly follow the concept, with sea shell motifs reflected on the bedding, gold clams adorning lamp shade stands and sea shells displayed on a glass bowl. The moment you step into this room, you’ll surely feel like you are on the seaside. Many consider the colors blue and brown to be a match made in heaven, and together with the classic sophistication of white, this color combination creates interiors which have the right balance of cool and warmth. This elegant designer bedroom exhibits a timeless beauty and sophisticated charm through the use of luxurious furniture pieces and a neutral color palette. Light blue walls keep the area looking fresh while the white oval recessed ceiling contributes breeziness to the room. Sheer white curtains that flow from floor to ceiling offers an abundant flow of natural daylight which illuminates the features of the space. The grand king size bed with a tufted white leather headboard and gold decor adds luxury without overpowering other furnishings. Satiny brown bedding with embroidered designs also add just the right amount of warmth without going over the top. The cool hue of light aqua blue is all you need to transform your own bedroom into an absolute oasis. There is also no need for high end finishes to create an interior that boasts of rich elegance, sometimes all you need are simple luxuries such as tasteful accessories and textured fabrics. Mirrored furniture, for example, displays a sense of sophistication, while timeless lighting fixtures like the chrome silver table lamps and the classic chandelier bring a stylish flair. Layering of textures can also be achieved through the use of different types of fabric just like the light blue velvet upholstery for the sofa, the satiny duvet covers, the silky pile carpet and the sheer white curtains combined with blue printed panels. A warm contrast is added through the use of light engineered wood flooring , while pristine white recessed ceilings and high gloss white cabinets, balance the look of this space. 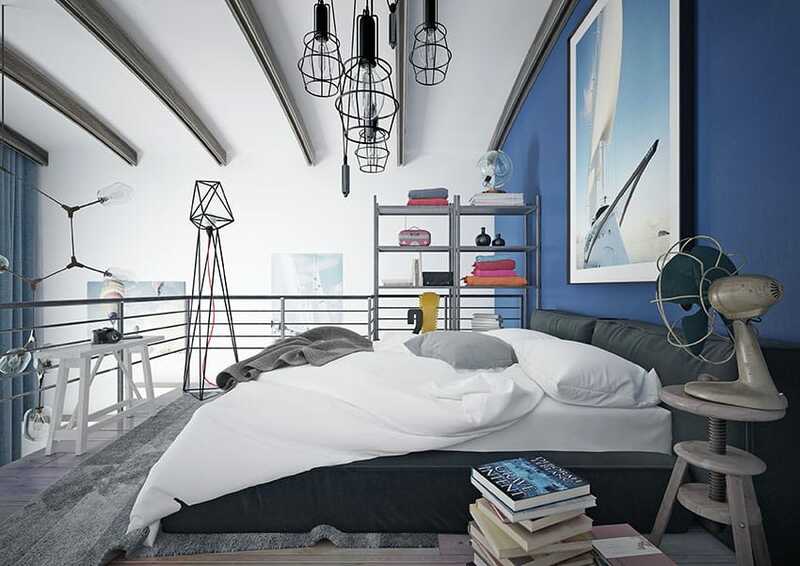 Shown above is an artsy modern loft bedroom with blue walls and a white ceiling. The cobalt blue hue on the bed wall creates sharp focus in the room, while the clear white ceiling which transitions to the walls give the interiors a sense of continuity. A queen sized bed with charcoal gray upholstery is perched at the center of the room, giving an edgy accent in terms of color. The combination of shades of gray, white and blue has the power to add a strong sense of style without being too overwhelming. To make the space more visually interesting, trendy accessories are added, just like the geometric Edison drop lights, the sculpted metal floor lamp and the retro fan placed on top of the uniquely crafted wooden side table. The unique design of this bedroom’s interior is perfect for a bachelor’s pad. This trendy blue and white bedroom is encompassed by tall glazing and white walls which give off a clean, bright ambiance. The floor to ceiling glass windows enable a plentiful amount of natural lighting to illuminate the interiors of this modern bedroom, while light colored wood flooring give an illusion of a wider space. Graceful flowing white and bluish gray drapes soften the angular forms of the windows and provide a contrast in texture. A low fully upholstered bed with a padded headboard conforms with the neutral color scheme of the space, exhibiting contemporary contours which go well with the streamlined floor lamps and side tables. A graphic area rug then serves as the accent piece, delivering bright pops of color which instantly liven the mood of the space. If you want to add an illuminating punch to your “blue and white”color scheme, then the perfect shade of gold should help you do the trick. This contemporary bedroom combines bright hues with rich textures and heavy patterns. The moment you look at this bedroom, the first thing that you’ll notice is the extravagant accent wall with seamless circular patterns of gold juxtaposed to a built up wall covered in printed blue wallpaper. This main feature truly directs the attention of the eyes to the bed. Crisp white linens and clean pillows stand in contrast against an elegant charcoal gray queen size bed with a tufted headboard. A dark colored carved wood night table that matches the chest of drawers at the edge of the room, provide complementing colors to the design palette. 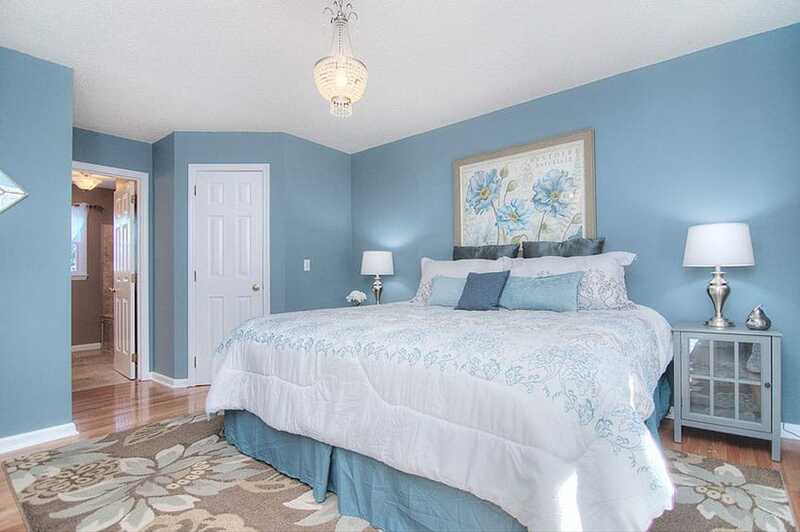 The blue area rug that spans along the floor harmoniously blends with the accent wall. Black and white striped accent chairs add a finishing touch of fun and eccentricity, making the room less dramatic and more modern. The bright and refreshing appeal of gorgeous teal blue furnishings dominate the interior of this contemporary classic masters bedroom. Composed with elegance and class, the rich textures of this interior is nothing but a true perfection of a monochromatic scheme. A mirrored four poster bed with a lush velvet headboard and fleur de lis patterned beddings make a grand statement at the heart of this room, serving as a stunning and eye catching focal point of design. The light colors of the beige carpeted flooring and the white crown molding of the ceiling balances off the look by breaking the monotony of the color scheme. A dark accent color found in the black frame of the day bed and the ebony night tables also serve as contrasts without clashing with other design elements in the space. This gorgeous cottage style bedroom has light aqua blue walls paired with white furniture, white trims and a white ceiling. The beige plush carpet flooring gives a contrast in texture against the smooth satin finish of the classic furniture pieces. Large curved windows with plantation shutters provide semi privacy and allow natural lighting to pass through, making this interior bright and airy. A natural oak storage chest adds warmth to the space, bringing about coziness and a welcoming feel to the space. The simplicity of classic furniture pieces such as the full sized bed with paneled headboard and the night table with turned legs complete the cottage charm of this blue and white bedroom. The timeless beauty of this classic inspired master’s suite radiates sophistication and charm. Dusty blue velvet drapes that flow over the clean white walls bring grace. The subdued floral prints on the carpeted flooring add a subtle accent without overwhelming the overall look of the space. A cozy seating area with two blue velvet upholstered armchairs and a white shaggy ottoman is placed at the corner of the room, offering a place to lounge or lay back while enjoying one’s favorite book. The massive king size bed serves as a striking accent piece with its golden brown brocade fabric. White linens, duvet covers and pillows tone down the printed upholstery on the bed, while classic accessories like a brass wall lamp and an ivory lamp shade lend tasteful finishing touches to the space. 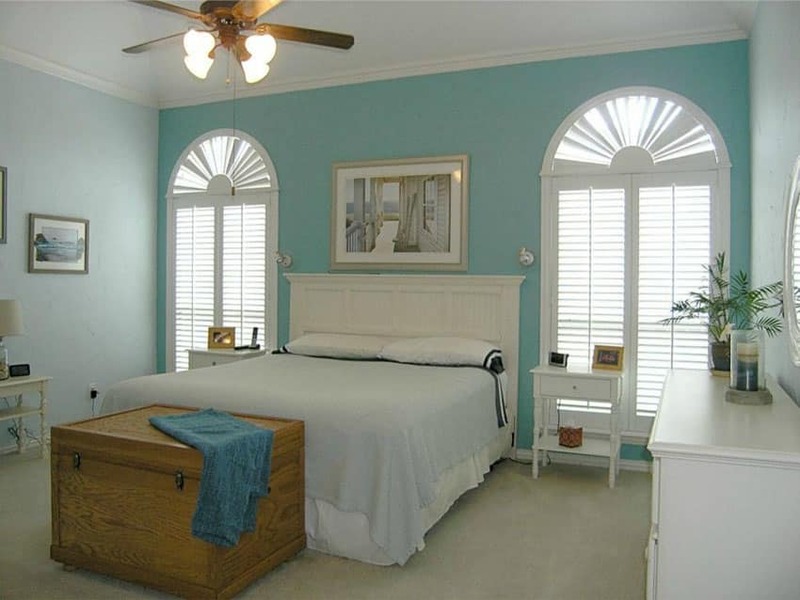 Shown above is a kid’s bedroom with light blue walls and white trims. The layout of this space is carefully planned as it takes advantage of the ceiling height of the room. 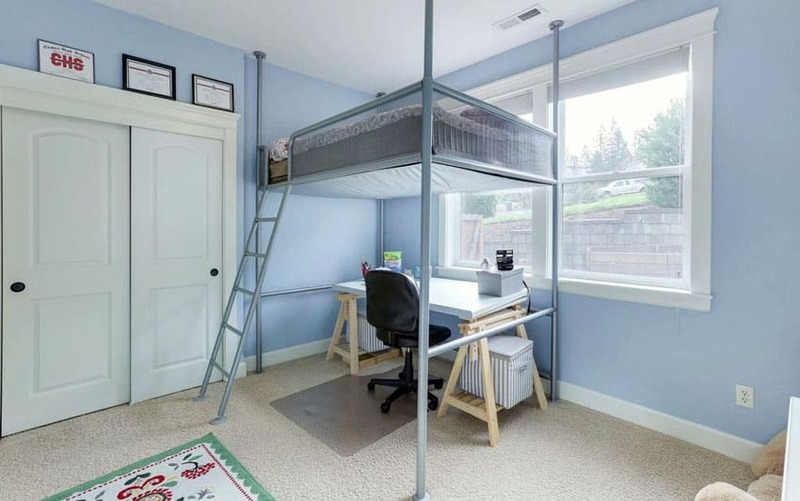 Maximizing the floor area, this bedroom made use of a suspended bed supported by metal posts and underneath it is a study area. The area below the bed is furnished minimally with a wooden desk and an office chair. Furnishings and accessories are reduced to the essentials to achieve a decluttered look. The light colors reflected in this interior all make this bedroom appear more spacious – from beige colored pile carpet flooring, to the delicate colored walls and the crisp colored ceiling. Overall, it displays a tranquil atmosphere that is not distracting and is ideal for studying. This contemporary classic bedroom exudes charm and elegance with its pastel colors palette. The classic combination of blue walls and white ceilings create a perfect canvass for showcasing pops of color through this bedroom’s interior. The cool hue of light powder blue walls give off a peaceful mood while the white baseboard and trims add an complimentary color which perfectly matches the crisp, clean look of the ceiling. A beige pile area rug that spreads at the center of the room breaks the dark rich color of Jacobean stained wood flooring. Unexpected splashes of color from the sea green colored night table and the navy blue tufted arm chair bring life to the space, while a dusty peach bed cover adds a feminine touch. The overall look of this refreshing bedroom is tied with the use of a triad of paintings over the headboard, that reflects the whole color scheme of the interior. Emanating a more youthful vibe, this bedroom has the perfect makings of a relaxing bohemian inspired retreat. Dark blue walls give this room a formal yet refreshing ambiance. 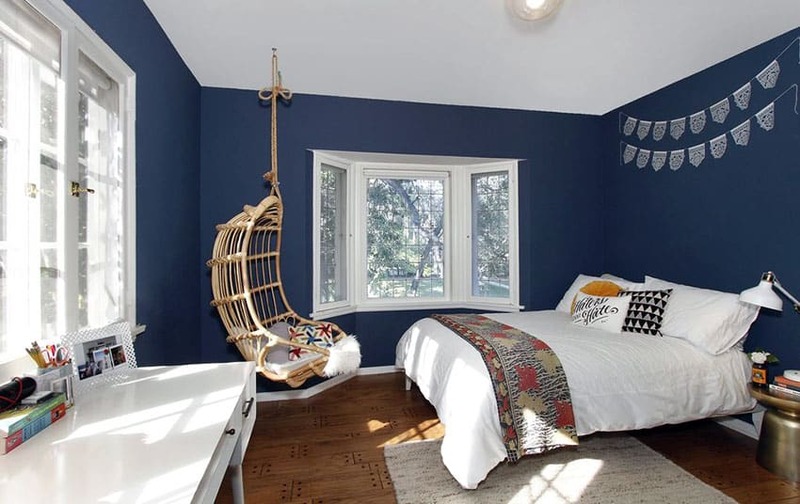 The laid back appeal of this teenager’s bedroom is achieved by using a cozy cocoon chair that hangs from the ceiling, providing a relaxing spot to enjoy a book or to simply hang out. Classic white window trims and white baseboards balance the strong tone of the walls while complementing the colors of other furniture pieces like the classic wooden desk. Medium stained wood flooring offer a touch of natural coziness while adding some life to the color palette of this space. Accent pillows with different printed patterns and graphic art designs contribute some fun and quirkiness to the overall design.